I know it’s January and I’m supposed to be focused on wellness and clean eating, but the thing is, I need comfort food right now. That means noodles. 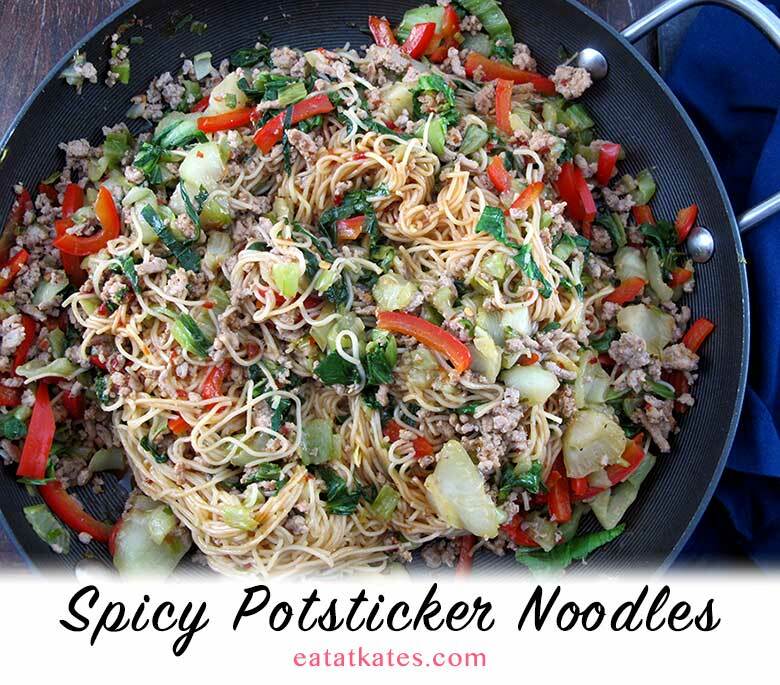 Especially noodles that mimic all the savory, spicy flavors of potstickers without all of the work of actually making potstickers. – Delicious, crispy, browned ground pork. – Crisp, crunchy baby bok choy. – Spicy, garlicky Soy-Sesame Sauce. That’s like a warm little hug while you wait for spring, right? So, if you’re still committed to your new-year-new-you-clean-eating-let-me-at-that-treadmill resolution, have at it. Pssst… want to hear more from Eat at Kate’s? Then make sure to sign up for updates through the form on the sidebar! Noodles with all that fantastic potsticker flavor without all the work (or, at least, less work) than making them yourself. Cook noodles according to package directions, rinse in cold water, lightly coat with oil, and set aside. Mix together soy sauce, sesame oil, chili-garlic paste, & cornstarch; set aside. Heat large saute pan over medium high heat. Add pork to pan and cook, season with salt and pepper and break into small pieces using a spoon or spatula. Let the meat cook until the fat begins to crackle, about 10-12 minutes; it should be very brown, almost crispy. Add bok choy root and scallion whites to the pan and stir into the meat. Let cook for 4-5 minutes, stirring occasionally. Add red pepper and cook for about 2 minutes. Clear a space in the center of the pan and add the garlic and ginger; let them sit for about 30 seconds, until fragrant, then add the bok choy leaves and stir everything together. Once the bok choy leaves have wilted slightly, add the cooked noodles and the sauce, mix so everything is coated and cook until the sauce thickens; 1-2 minutes. Remove from heat and serve with scallion greens and additional soy sauce and chili-garlic paste. 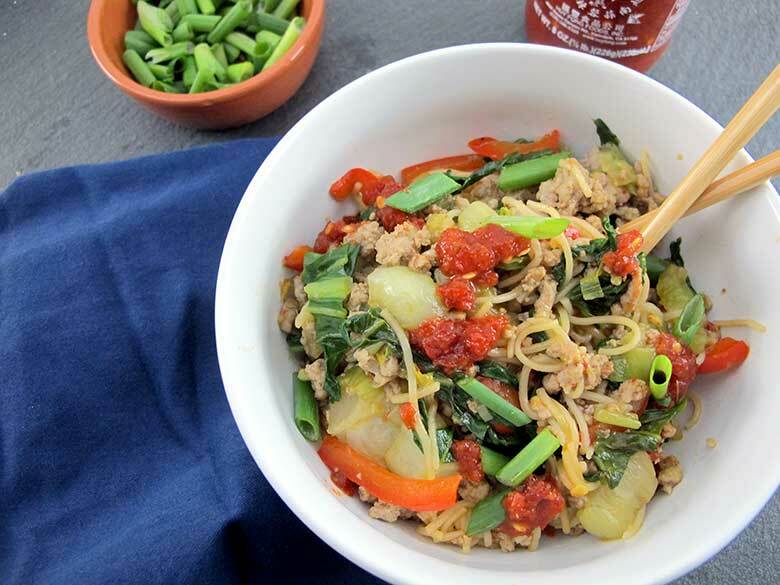 Noodles: I’ve made this recipe with three different types of noodles. While all were good, I prefer udon noodles. Udon noodles are slightly thicker than soba (buckwheat) noodles and stand up a bit better to all of the ingredients. My least favorite are actually the ones pictured here: somen noodles. They are too thin and make it difficult to get that “perfect bite”. Ginger: If you prefer to use ground ginger, use about 1 teaspoon and mix it in with the sauce ingredients. ok my dear–it’s on the grocery list! making them this weekend-yum! Hooray and thank you! Please share your feedback, most importantly if anything didn’t quite work or was confusing! Yes! So glad to hear it was a success!